Tai Shan Media Group Inc.
Ms. Juliet Lu is a Chinese American born in China’s East Coast City, Rizhao, Shandong. Ms. Lu is the CEO&President of Tai Shan Media Group Inc., a company specializing business in TV Network and Broadcasting, TV program production, Marketing & PR and Talent Agency, as well as promoting the cross-culture communications between the United States and China. Tai Shan Media Group is the strategic partner of Shandong TV, one of China’s Top Television Stations with more than 700 Million Viewers’ coverage in China. 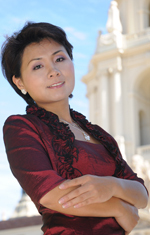 Ms. Lu also serves as the Chief U.S. Representative of TSTV, Shandong TV International. Prior to this, Ms. Lu was the Founder and CEO of jjyou.com, an Internet startup company which launched China’s first Social Network website for business Professionals. The website was elected as Top 100 Internet companies in China in 2005. Besides her professional work, Ms. Lu is very active in volunteering for the community and various organizations. She has served as the Committee Member of Crystal Ball under Methodist Hospital Foundation since 2010 and helped the hospital raised more than $800,000. Ms. Lu holds a Master of International Management degree from Portland State University, Oregon. She also holds a Bachelor of Art degree from Xi’an Foreign Language University, ShaanXi China. At her spare time, Ms. Lu likes to travel, read, movie&TV, singing&dancing, and exercise especially Ping Pong.